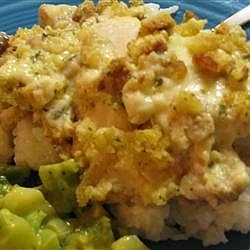 I've got some awesome easy chicken casserole recipes...they are my favorites. I hope you and your family enjoy them. You may substitute turkey with any one of these chicken hot dish recipes. These casseroles are made in one dish and so easy to prepare. Serve any of these casseroles with my homemade bread. These creamy easy chicken casserole recipes will soon become family favorites. From savory Swiss Chicken Casserole to Chicken, Chicken Biscuit Casserole and Dressing Deluxe Casserole; yum! PREHEAT oven to 350 degrees. Lightly spray a 9x13 inch pan with vegetable oil. In a heavy skillet, melt 2 tablespoons of butter and canola oil until hot. Sauté the spinach and mushrooms and place in bottom of dish then placed the uncooked chicken on top. Melt the butter in a medium saucepan over medium heat. Stirring constantly, mix in the garlic, lemon juice, cream of mushroom soup, Italian seasoning, cream and Parmesan cheese. Pour the sauce over the all and top it off with the crumbled bacon. Bake for 25 minutes. Remove from the oven and top with cheese. Continue to bake for 25-30 minutes or until the cheese is light brown and bubbly. Cut up chicken into chunks. Cook chicken and minced garlic together in a pan with a few tablespoons of olive oil. After chicken was cooked, add the soup, cream, 1 cup shredded mozzarella, and lemon juice. Stir it all up on medium heat til creamy and then poured the entire mix on top of the spinach and mushroom layer as stated in the recipe. Then sprinkle crumbled bacon on the top and baked for 25 minutes. Eat this on top of buttered pasta. Here's another one of my easy chicken casserole recipes that is a breeze to make and so good. Serve with a salad and homemade bread. Delicious. PREHEAT oven to 350 degrees. Lightly spray a 9x13 pan. 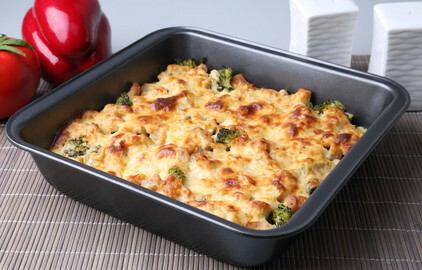 Arrange the chicken pieces in the bottom of the prepared baking dish and top each pieces with Swiss cheese. Combine the soup and milk; whisk well. Spoon this mixture over the chicken and cheese and then sprinkle with the stuffing mix. Drizzle with melted butter and bake for 50 minutes. Spray the inside of the crock pot with vegetable oil and place the chicken breasts on the bottom. Then add the cheese on top of the chicken, top with milk and soup mixture - then sprinkle with dry stuffing and pour melted butter over stuffing. Cover and cook 3-4 hours, longer if using frozen chicken breasts. It will NOT be dry so do not add anything more to this recipe. Here's another easy chicken casserole recipe that is delicious. Cut up chicken and cover with water. Add the salt and simmer until tender; do not boil. Let cool overnight in the refrigerator. The next day, skim off the fat. Remove the skin and grind it up. Bone chicken and cut into bite-sized pieces; set aside. Heat the fat in a pan and add the flour. Cook for a minute and add 1-1/2 quarts chicken stock. Stir until smooth. Add more salt if necessary. Cook the dressing ingredients together for 10 minutes, then pour over 1 loaf of stale bread crumbs. Spoon dressing into greased 9x15 pan, and arrange diced chicken over the dressing. Pour the gravy over all. Cover with buttered dry bread crumbs and bake at 350 degrees for one hour.